Crank Dynamo Flashlight with Radio and Solar Panel combines 3-LED flashlight with siren, FM and AM radio and solar panel, charging adapters, giving users a handy versatile camping accessory, job site companion, car gadget or in an emergency situation, such as a hurricane or an earthquake. This easy to carry device features 3 super bright LEDs, each of which is rated at 12,000 MCD, and it can last for 10 minutes if cranked for 1 minute. 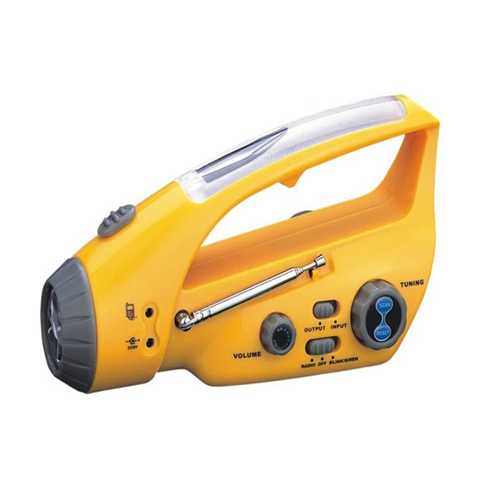 The flashlight is great for illuminating a campsite or dimly lit work area, campers will also enjoy the FM and AM radio and its built-in speaker. Made with Acrylonitrile Butadiene Styrene (ABS) (recyclable and has the number "9" as its resin identification code) and Polystyrene (PS) (recyclable and has the number "6" as its resin identification code). Reduce your dependency on the power grid and harness the eco-friendly power of crank dynamo. This quality-made hand crank dynamo device lets you convert mechanical movement into your own mobile power source for smart power anywhere, anytime. Hand winded 1 minute it can work over 10 minutes. Full of features makes it suitable for emergency use, camping, travel, outdoor acctivities, etc. Powers MP3* and MP4 players*, PDAs*, digital cameras* and more. Long battery life more than 10,000 hours. Flashlight work 6-8 hours after fully charged. Charges through hand crank as well as at home or in the car using AC/DC adapters. *please do not use this flashlight as power bank. When recharging by hand, please wind the handle with even force, do not use excessive force, avoiding damaging the internal gears of the product. This product is not intended for children under 4 years. Material： Acrylonitrile Butadiene Styrene (ABS) (recyclable and has the number "9" as its resin identification code)?, Polystyrene (PS) (recyclable and has the number "6" as its resin identification code)?